Comfortable and effective solutions for the care and health of your skin. This is the inspiration of the Leti Laboratories to increasingly improve the quality of life of its customers. A Unit of Dermatology specialist in skin care and leaders in atopy, nose and lips repair and skin redness markets, betting strongly in the field of Dermatology and Dermocosmetics. 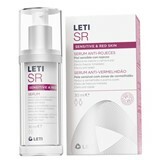 Leti - An in-depth view of knowledge and science, combined with the love for the skin.